As a matter of fact, over the last few weeks, I’ve seen the early signs of Spring…. tulips, daffodils, and the re-opening of Farmer’s Markets. 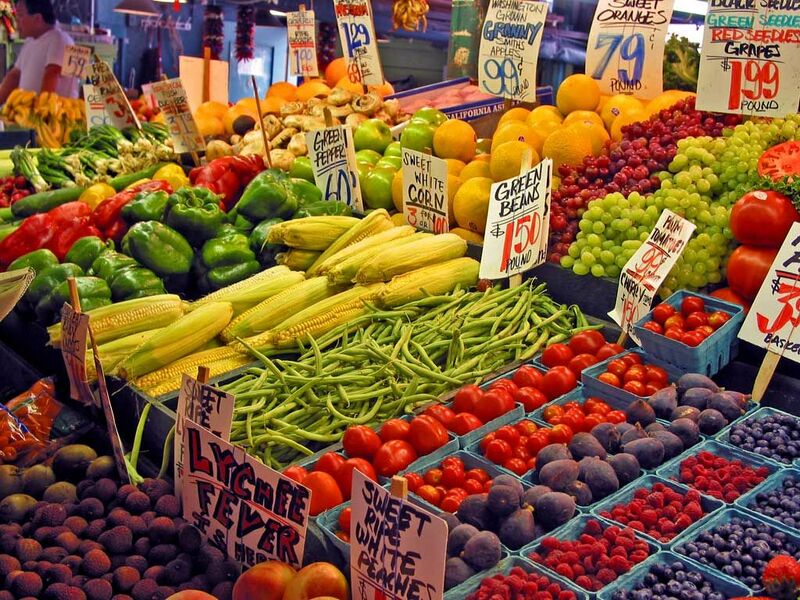 I can hardly stand the wait to get my hands on the fresh fruits & veggies from my local Farmer’s Market. I’m looking forward to taking it all in…. the hustle of other eager market goers, the crisp new air of a changing season, supporting the local farming community, meeting up with neighbors, and of course, ALL of the fresh sights & smells and of this seasons wonderful produce. It’s all quite cathartic… I think…. All of this goodness has a much more serious side. These jewels of the earth, if not handled properly, carry some risks. So here are a few tips that will help to keep you healthy while you enjoy nature’s yumlicious goodies ! Start with a clean kitchen, including cutting surfaces, colander, knives and sink. Wash your hands well before, during & between handling produce. Rinse produce under cold running tap water. In some cases, you’ll want to use a brush for extra cleaning (i.e. potatoes, mushrooms, yams, etc). Blot dry with a paper towel or clean cloth to further reduce any ‘bugs’ that may be left after the first rinse. Wash fruits and vegetables right before you plan to eat them. Washing and then storing them can promote mold and bacterial growth…. and who needs that?! Scrub firmer produce like potatoes, carrots, and cucumbers with a vegetable brush under running water to get at pathogens that may be in grooves or sticking to any waxy coating. For softer produce, like tomatoes, peppers, and peaches, rub them gently with your hands under running water. It’s often recommended that mushrooms be simply wiped with a wet paper towel or soft mushroom brush—but if needed, rinsing or spraying them with water, briefly and gently, is okay, too. With melons, wash the rind well before cutting to prevent any bacteria on the surface from being transferred to the inside by the knife blade. Yes, do wash your bananas—at least if you are going to handle the flesh. They could have bacteria on the peel. The same goes for oranges, lemons, avocados, mangoes and other fruits with skins or rinds that you peel with your hands or cut with a knife. Discard the outer leaves of lettuce. Rinse even the tightly packed leaves in the interior, individually when possible. You can use a salad spinner to dry them. One way to clean loose gritty greens, like spinach, is to immerse them in a large pot of cool water and allow a minute or two for debris to sink to the bottom; then lift out the leaves, rinse them in a colander, and spin dry. To clean berries, first pull off any leafy stems where bacteria may be lurking. Place in a colander and rinse or spray with water, shaking them gently. Blot dry gently. Some salad spinners come with special inserts to dry berries (and herbs). To wash herbs, dip and swish them in a bowl of water. Don’t use soap and detergents. They can leave residues that affect the taste and may not be safe to ingest. Special produce washes are expensive and not proven to be more effective than washing with water. Be aware of bruises. Bruised areas on produce may harbor bacteria. If there’s a small bruise, cut away a large section around it before washing. If there is significant bruising, especially on small fruits and vegetables like berries and grapes, toss them altogether. Wash organic fruits and vegetables as you wash conventionally grown produce. The same is true of locally grown produce and even produce from your own garden. I hope that this info is helpful….